Anyone thinking that a return to Marvel Dice Masters might be in some way influenced by the Daredevil TV series need only look at the comic’s title to have their suspicions wholly confirmed. What a show that turned out to be. We are only a little more than halfway through watching it, and it has already both raised the bar for comic TV shows, and leap-frogged Marvel’s other TV offering. By a considerable distance. In defence of Agents of SHIELD though, it had set that bar pretty low. SHIELD should have had everything going for it – the full weight of the Marvel cinematic universe, a great cast and set-up. It even has an enviable good plot that isn’t afraid to take big risks and shoot for big, memorable moments. It falls down on too many basics, though. Week to week the writing fails to be the glue that holds the show together. Instead of being a team of characters, all fully realised, sympathetic and interesting, the cast are simply the cast. Acting alongside one another with a script that hampers chemistry and depth. Daredevil, on the other hand, has a street-level character that is far removed from the powers and scale of the rest of the Marvel cinematic universe. A hero who is disabled, and a lawyer. Ten years of courtroom dramas filling our screens might have mitigated the dim view the world at large has of lawyers, but Daredevil has never had a good showing on a screen of any kind. On top of this, the show mostly eschews the ‘monster-of-the-week format that fuels almost all genre TV (SHIELD, Flash & Arrow included) in favour of a longer arc across the series. What makes all of this work is, amongst many factors, really good writing. If you don’t have that, you have nothing to build on. But Daredevil does, and it builds on this spectacularly with a pitch-perfect cast, incredible set pieces and fight choreography, and a villain that is as interesting as the hero. Showrunner and lead writer Drew Goddard cut his teeth on Joss Whedon TV shows, and it shows in his handling of characters. In how they all feel real, multi-faceted and fully realised. This means I care more about them, their world, and the show. 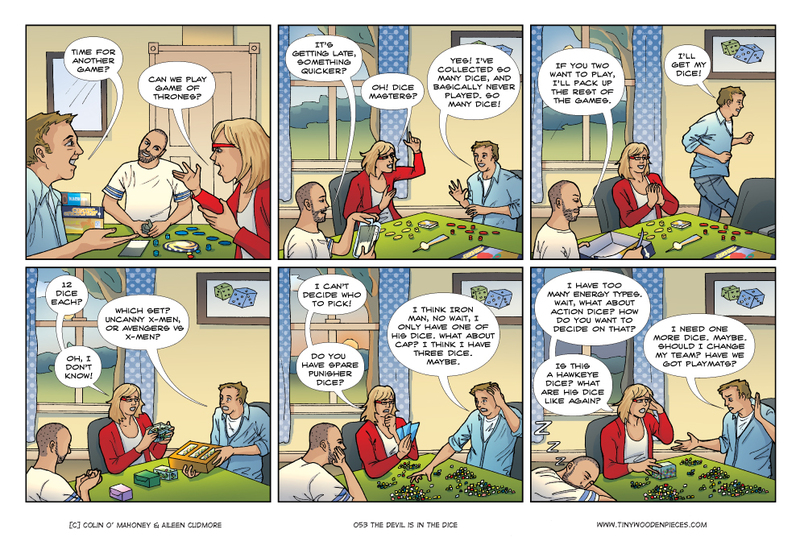 If you are thinking that the scenario in this comic has more to do with myself and Aileen’s perpetual state of disorganisation, and less to do with Marvel Dice Masters, than you may be onto something. But in our defence, I would like to say: How the heck ARE you supposed to store that many dice and cards and remember how many dice you have for each card? What kind of system do you use? And how could such a thing ever be portable? Seriously though, if you have a good suggestion, do let us know. We might actually get the game to the table once in a while. 1. I don’t have that much scope for playing 2 player games. My wife only plays a limited (but growing!) subset of games. I have 2 kids, and merely playing with one of them isn’t usually an option. And my gaming group isn’t really big enough for 2 players to wander off to play a game together. The set-up time for Escape isn’t all that bad, I find. But I guess if you have a lot of components and set mixed up in the box it’s going to be worse. We only have the base game, and can get it out pretty quickly. Great fun, though. We will be playing Eclipse tonight, speaking of long set-ups being a problem. That’s a game that needs dividers etc in the box. That’s bizarre. I don’t see why an expansion with set cards would be randomly assorted in a trade box. It would surely still be worth stocking though? I think he was refusing to stock it on principle, because he didn’t want to encourage that kind of distribution. I can see his point – I know that when the Dice Tower guys reviewed some (4?) of the expansions, it was definitely a case of a couple of them being reviewed better than the others, and you don’t want to buy a trade box only to discover that you’ve only got a limited number of the expansions people want and a load of the less popular ones. What I use for my Dice Masters collection is a plano box with many compartments. I have the dice in alphabetical order (so yes you’ll have hulk and hawkeye in the same compartment but you can much more easily sort those 2 out). Also I suggest have some ‘decks’ pre assembled. Take a deck box (ultrapro for example) and have a team ready with cards and dice. If you want you can even have a couple of those ready so you can play easily. You’re the second person to mention a plano box, I’ll have to investigate. We’re based in Ireland, so not even sure if we can get them over here. You’re right about the deck boxes though, we should buy a bunch more of those. The ones we do own are currently occupied with Netrunner decks. Lidl and Aldi frequently sell various tool boxes, fishing tackle boxes, etc that might work in a pinch as well without costing a fortune. I am a big, big fan of Plano (and other similar style of boxes) for board games. Most of my board games have the inserts removed and thrown away. I replace it with Plano to help organize all of the bits. The convenience of this design is that it makes game setup and take down much quicker. The downside is the cost because now most of my games I have one or more Plano containers along with the game itself. Even so, I find it worth it. Also, Plano is just a big name behind the concept, there are other great containers out there. For instance, Really Useful Boxes makes a couple of boxes that are perfect for storing cards for quite a few of the games. Systema makes plastic containers for people for their lunches and stuff like that, but they have a couple of containers that fit cards really well as well. Harald85 mentioned a couple of great places to find Plano type boxes. The best place in my experience for the Plano style of boxes is in stores that cater solely to fishing, camping and other such outdoor activities. They usually have a great array of Plano type containers to choose from. But, I have also found great containers in office supply stores and crafting stores and in the kitchen section of stores. I use a binder for the cards which are organized alphabetically by character. Each genre is kept together. One section for Marvel, one for Yu-Gi-Oh!, and one for D&D. My dice are kept in huge Artbin storage box that lets me have 40 tiny squares. For quick reference, I keep a spreadsheet of how many cards and dice I have. Y’know, a binder might actually be worth investing in, for ease of putting together decks. And a spreadsheet sounds like an excellent idea as well. Handy as a tool for deck-building as well, I’d guess. I have a couple of binders for the various sets, though you could easily use a card box. All you need to hold onto is 1 of each unique card. Everything else can go in a separate box for trades. As for dice, I have a plano box and a bead box, with 4 of each character die, since that’s all I ever need. I have all my extra dice in bags sorted by set, just incase. When I travel, I just take my plano/bead boxes, and card binders. Sure, it’s a bit to take, but it’s easier than taking everything. Some sort of bead box that could section off the dice would be great. Someone on Twitter mentioned the official Setup/Collectors box, I should check that out. I have a spare Quarriors box. Perfect solution.